Will bamboo offered at Bamboo Your Privacy take over my yard and my neighbor’s yard? No. We only stock clumping (non-invasive) bamboo, running (invasive) bamboo is only available by special order. Clumping bamboo and running bamboo have different rhizome systems. Clumping bamboo grows new shoots that branch off of existing culms. Although, they send out new shoots every year (spread), these grow very close to the mother plant or original culms forming a “clump” of culms. This characteristic does not only give them their name “clumping bamboo” but makes them very easy to maintain if necessary. Running bamboo has rhizomes that travel several feet underground, in several directions, every growing season which send out new shoots. These new shoots will then grow more rhizomes that travel several feet underground, in several directions, every growing season, which will send out new shoots, and the story repeats… This is why running bamboo takes over your yard and your neighbor’s. Since we don’t offer running bamboo we will not have any additional information about it. Please do your research if necessary. 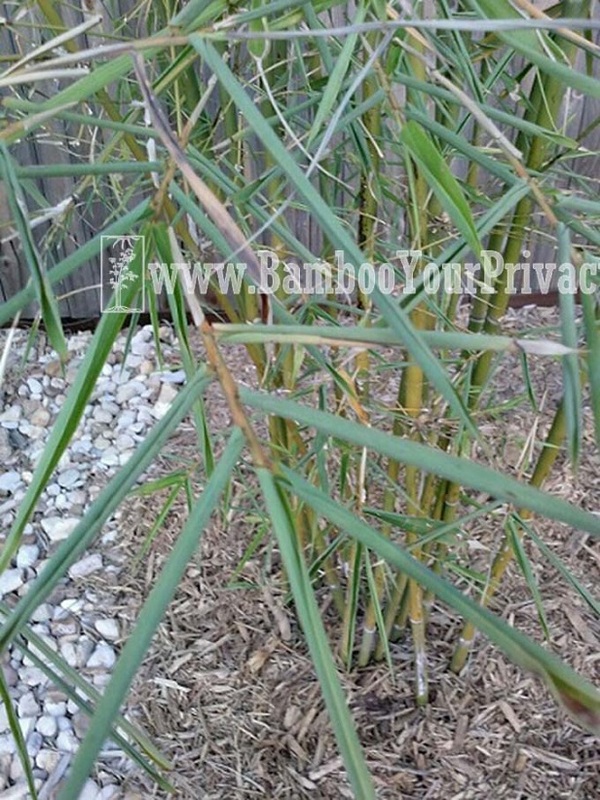 At Bamboo Your Privacy, we ONLY STOCK clumping (non-invasive) bamboo; our clumping bamboo will NOT take over your yard or your neighbor’s yard. Although, we do not stock running bamboo, we can acquire it by special order. What clumping bamboo variety is best for me? How big is the space that you need to cover, in length? We recommend planting the bamboo between 3 or 4 feet apart, closer if you want your privacy hedge to fill in faster. How tall is the space that you are trying to cover? We offer varieties whose terminal height is ~12 feet up to varieties that grow ~50 feet tall. What features or characteristics are you looking for in your bamboo? We offer varieties with various cosmetic characteristics: different culm widths, green culms, yellow culms with green stripes, broad leaves, small leaves, striped leaves, tight clumpers, upright growers, umbrella-shaped varieties, etc. Once you figure out the space available and desired features we can help you find your perfect match. Visit our Availability page for a description on features and characteristics available. What if I like a variety that grows taller than the space I have available, can I make it work? Bamboo grows upward, in other words, bamboo grows from the top out. This means that once you cut the top of the culm, it prevents it from growing any taller. Trimming the top of the culms does not only manage the height of your bamboo plant but also encourages the growth of new canes. The branches will continue to grow from the nodes on the main shoot, feel free to trim to your liking but the culm will remain at that same height. That being said, you have to be extremely careful with the new shoots coming out of the ground, new shoots are very fragile and once these are cut or broken, that will be the height of that culm for the rest of its life. When does bamboo put out new shoots? 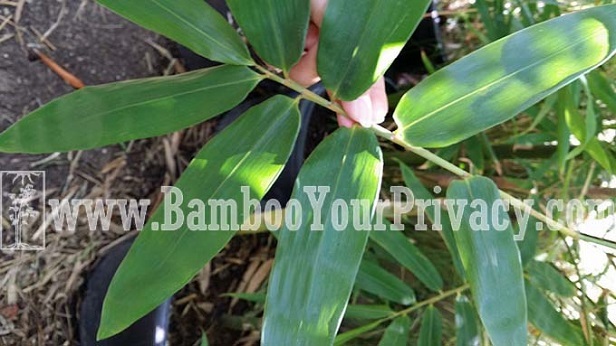 Bamboo normally develop new shoots between May and October, and are dormant in the winter. How often does my Bamboo need to be Watered? For a newly planted bamboo: Watering depends on the time of the year when your bamboo is planted; if your bamboo is planted in the middle of summer expect to water it every day, if planted in the fall, water every day for two to three weeks and after about twice or three times a week. For etablished plants over 1 year: expect to water about twice a week in the middle of Austin's hot summers. Your bamboo plant will tell you when it needs water: If the leaves on your bamboo look like the ones on the image below WATER IMMEDIATELY! Once you get the hang of it do not wait until the leaves look like the ones on the image below, water it before it gets to this stage so that it grows appropriately and does not just survive. Due to the fact that we do not have control of watering or, lack thereof, and preventing over fertilizing we do not provide warranty for these reasons. Does bamboo need fertilizer, if so, what fertilizer should I get? Bamboo is a grass, it does not normally need to be fertilized but if you want to encourage fast growth, greener foliage, and an overall healthier plant, feel free to do so. If you choose to fertilize, we recommend fertilizing in the spring and summer before new shoots start to develop and throughout the growing season with a high Nitrogen fertilizer. Fertilization can be done again between July and August when the roots are expanding with a high Phosophorus and Potassium fertilizer. For bamboo grown in containers, we encourage you fertilize less often. Please read and follow directions on fertilizer carefully, otherwise, damage can be done to the plant. During the growing season (May - October), bamboo prefer high Nitrogen, and balanced-moderate Phosphorus and Potassium content fertilizer. What?! What does that mean? All fertilizer labels have three bold numbers, known as the fertilizer grade which is a national standard. and, the third number is the amount of potash (K2O). These three numbers represent the primary nutrients (nitrogen(N) - phosphorus(P) - potassium(K)) in fertilizers. Example: A bag of 20-7-7 fertilizer contains 20 percent nitrogen, 7 percent phosphate and 7 percent potash. First number encourages growth - UP! Second number healthier roots - DOWN! Third number overall health and stress resistance - ALL AROUND! This is why high Nitrogen fertilizer is given in the spring and summer and high Phosphorus and Potassium is given in late summer and early fall. Winter fertilization is not encouraged nor recommended.